Ricardo Martinelli when they read him his rights after his extradition. Later that day, on account of a claimed heart condition, he was sent to the prison ward at Santo Tomas Hospital. From the court’s video feed. Late in 2010, Ricardo Martinelli promulgated a law that any act of violence committed by an on-duty law enforcement officer is legal. That following January, inmates at the Tocumen juvenile detention center were deprived of water for eight straight days. A prison rebellion broke out, and after those who participated in the riot surrendered, they were beaten and shot with birdshot. But in one cell the boys did not take part in the revolt, for one thing because most of them were due to be released in a short time. They shut themselves in their cell. So the police — before the video cameras of two different television networks — set the cell on fire, blocked the firefighters from entering the premises to put out the fire, taunted the screaming boy as they were burning to death, then beat those who survived — mostly not for long — on their charred skin on their way to the ambulances. German and Japanese commanders whose subordinates committed lesser crimes against humanity were hanged for this after World War II. There is a concept of command responsibility in international law and under the laws of most nations. Here, however, there is de facto impunity for rabiblancos and for members of the political caste. 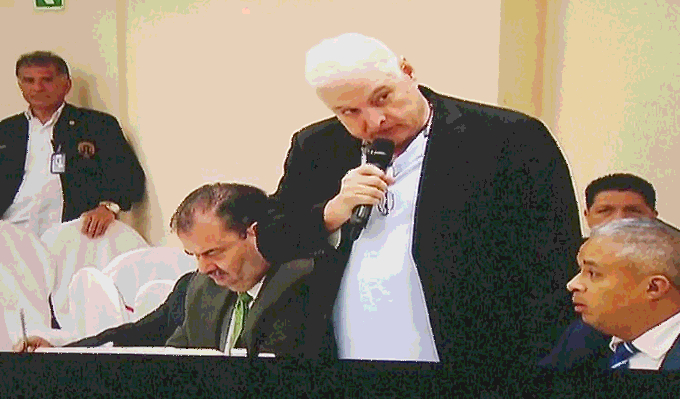 Ricardo Martinelli gave his horrific demonstration to the nation of how tough he is, and has never been investigated or charged. But Ricardo Martinelli did that televised extrajudicial torture execution. He authorized it in advance with his signature on a law granting impunity, the promise of which was later broken as to the cops who set the fire. It is in that light which we must see Martinelli’s pleas for due process of law, and for a hospital bed rather than a prison cell for his claimed high blood pressure and heart arhythmia. We are dealing with a vicious criminal, a man who fled the country to avoid prosecution. He is not entitled to any sort of bail or house arrest. But like any other inmate he is entitled to medical care, in the usual place where prisoners receive it. Let Panama not fall into the sickness of the United States and other countries, where more imprisonment under more brutal conditions is a popular political issue. Ricardo Martinelli and Donald Trump are explicitly in favor of police brutality and prison torture, but it would demean the Panamanian people to apply this standard to anyone, no matter how deserving. The rule of law and the inviolability of humnan rights must begin with this vile creature. Donald Trump and Kim Jong Un agreed on precisely nothing specific at their summit. Afterward Trump suggested that the United States would stop its joint military maneuvers with South Korean forces. That the meeting happened at all may have broken down some of the tension, but surely North Korea is not going to give up its nuclear weapons so long as its traditional enemies have them. The promise that “the DPRK commits to work toward complete denuclearization of the Korean Peninsula” is not any sort of enforceable demilitarization agreement. Does Kim want to get himself and his country annihilated in mushroom clouds? Surely not, and surely he never did intend to press the button on anyone and set that off. But as long as he is in power in North Korea, that country will be part of the nuclear-armed club. The summit did not change that. How might South Korea react to that? They have their own policy aims and national political divisions. They seem committed to a peace process, short of reunifying Korea under the northern government. It’s not entirely up to them whether the US forces leave — the Americans have every right to do that on their own initiative. Figure that in Seoul they may not find Trump’s unpredictable policy so reassuring. Perhaps the South Koreans are looking around for more reliable guarantors.